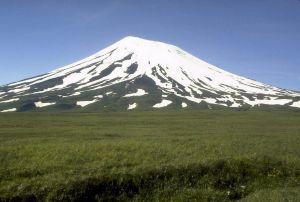 This peak is #22 in Prominence List for Alaska .Mount Vsevidof is the highest point on Umnak Island and the third highest point in the Aleutian Islands. It's an active stratovolcano whose last last eruption was in 1878. The massif contains a few smaller glaciers but is mostly ice free. Access is from the community of Nikolsi to the southwest. From the village hike northeast, cross Black Creek, then slog to the top from any direction. From Alaska Volcano Observatory: From Miller and others (1998): "Mount Vsevidof is a symmetrical stratovolcano near the southwest end of Umnak Island. It is about 10 km wide at the base and steepens from 15 degrees at 300 m altitude to about 30 degrees near the summit. A circular crater, 1.2 km in diameter, occupies the summit. Glacial ice fills the crater and extends down the north and east flanks of the cone; some of these glacial tongues have incised narrow canyons up to 120 m deep.